West Indies clinched the Champions Trophy with a thrilling two-wicket victory over England at a chilly Oval. England were bowled out for just 217 in bowler-friendly conditions, despite Marcus Trescothick's 104. 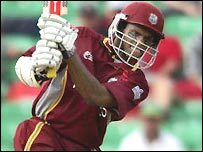 But they reduced West Indies to 147-8 before Ian Bradshaw and Courtney Browne fought back with a West Indies record ninth wicket stand of 71. In rapidly deteriorating light, Bradshaw hit 35 and Lambeth-born Browne 34 to win with seven balls left. In ecstatic scenes, West Indies celebrated their first major tournament victory since 1979 on a ground where England consigned them to a 4-0 Test series whitewash last month. But it would not have been possible without an alliance that was the West Indies' highest ever for the ninth wicket, topping a stand of 63 by Joel Garner and Malcolm Marshall against Australia in 1985. England's total appeared under par despite the seamer-friendly conditions as they were bundled out with two balls remaining. Medium-pacer Wavell Hinds was the surprise pick of the Caribbean bowlers with a career-best 3-34, bowling unchanged through the middle of the innings. It would have been much worse for the hosts had Ashley Giles not joined Trescothick in a seventh wicket stand of 63 from nine overs. Left-armer Bradshaw had done the early damage, tempting Vikram Solanki into an edge behind and causing Michael Vaughan to bottom-edge onto his stumps. But the crucial moment came with the arrival of Hinds, who could easily have been savaged by the in-form Andrew Flintoff. Instead, Flintoff was sent on his way first ball, his pull plucked out of the air by Brian Lara at midwicket, and from there wickets fell as soon as any batsman began to settle. Paul Collingwood, miscuing a lofted drive, and Geraint Jones, off a leading edge to midwicket, completed the haul. Trescothick survived the deluge, making good use of the cut in reaching his eighth one-day international century from 122 balls with 13 fours. But another brilliant piece of fielding by Lara, throwing in from mid off, saw him run out with two overs remaining and England lost their last four wickets for six runs. Given their perilous state, the home side had no choice but to attack, but the policy brought results almost immediately, despite a rash of wides and no balls that brought 35 extras. Harmison accounted for Hinds and Gayle, who made 23, either side of Flintoff's dismissal of Ramnaresh Sarwan, who edged the bowler's first delivery to a diving Andrew Strauss at slip. And Flintoff bagged his next brace in successive overs, Lara caught behind off a loose waft and Dwayne Bravo nicking a push on the off side. When Collingwood had Chanderpaul caught at short cover off a leading edge in the 34th over it seemed only a matter of time before the last rites were administered. But with the run rate never a problem, the Barbadian duo played patiently, blunting England's strike bowlers, whose over quotas were all used up early. Alex Wharf was entrusted with bowling at the death, Browne thrashing him through third man to begin the celebrations and Bradshaw square-driving a further boundary to seal a famous win. England: M Vaughan (capt), M Trescothick, V Solanki, A Strauss, A Flintoff, P Collingwood, G Jones (wkt), A Wharf, A Giles, S Harmison, D Gough. 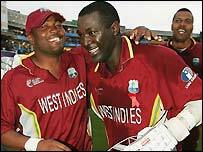 West Indies: B Lara (capt), C Gayle, W Hinds, R Sarwan, S Chanderpaul, R Powell, D Bravo, R Hinds, C Browne (wkt), I Bradshaw, C Collymore. Umpires: S Taufel (Aus), R Koertzen (SA).